Chicken is definitely one of the foods that crops up on a regular basis when people talk about healthy eating – although when it comes to fast food, chicken based burgers and meals are not necessarily diet friendly at all! Chicken is a great source of protein, as well as being low in fat and it’s full of useful nutrients like vitamins B6 and B12. Chicken also contains selenium and is a source of the amino acids that help the body to make the ‘happy hormone’ serotonin. Fried chicken is one of those delicious treats that can pile on the pounds – and the restaurant and take away versions of fried chicken are full of fat and salt. Far better to have a go at making your own healthy versions of chicken recipes so that you can indulge safe in the knowledge that with these recipes you are doing your body good rather than harm. Mix the flour and seasonings together in a large bowl until they are well combined. Coat the chicken thighs and drumsticks with oil. Then press each piece into the flour mix until it’s completely covered. Bake the chicken in an oven, preheated to Gas Mark 6 (200 degrees) for 40 minutes, turning halfway through cooking. Serve with homemade coleslaw and corn on the cob for added authenticity! Better than a kebab, and full of vegetable goodness too, these skewers are just perfect for barbecuing and grilling. Take the chicken breasts and cut then into rough cubes. 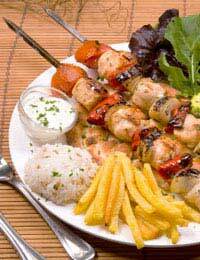 Thread each piece of chicken onto a skewer and layer with the courgette, onion and pepper pieces. Brush each skewer with olive oil and lemon juice, and place under a pre heated medium grill or on the barbecue until browned.These skewers are great served with rice, or in a wholemeal pitta bread with salad and some sweet chilli sauce for an authentic kebab shop experience! Chicken burgers from a burger bar are almost as high in calories and fat as their beefy cousins, so give them a miss every once in a while and make a healthier chicken burger instead! Place the chicken breasts in cling film and hit them with a rolling pin or another heavy kitchen implement to smooth them out to half their original thickness. Beat the egg and mustard together in a bowl until well combined and season with the salt and pepper. Dip the chicken breasts into the egg mixture, then press into the breadcrumbs until well covered on both sides. Put the chicken onto a baking tray and grill under a pre heated grill for at least ten minutes, turning once. Serve the burgers in a burger bun with reduced fat mayonnaise and salad.